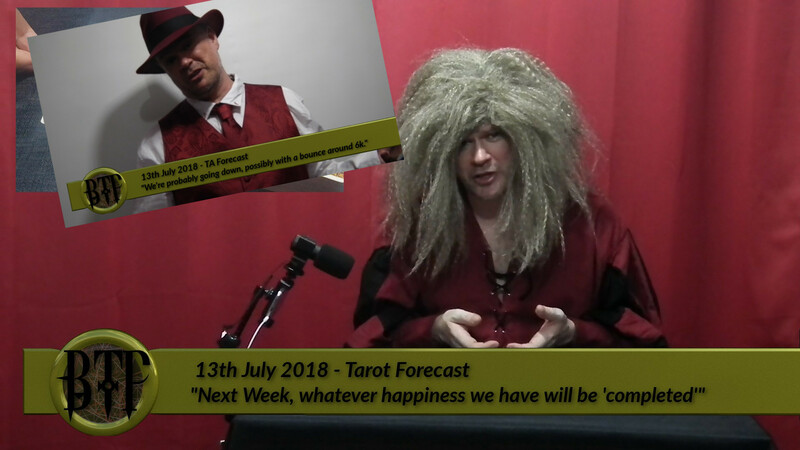 Last week Cosmic Conroy read the cards and found that we should make hay while the upcycle-sun still shines while analyst Charting Chad said that the price would likely bump then end the week down. Who was right? What grades did the judges give? Which is winning, Technical Analysis or Tarot reading? And what the heck will happen to Bitcoin’s price next week? All this and more in this week’s Bitcoin Tarot Podcast. [*Tarot-synopsis] Whatever happiness we have, will soon be complete. [*TA-Synopsis] We’re probably going down, possibly with a bounce around 6k.